When young Annabelle finds a box of yarn and knitting needles, she begins by knitting herself a colorful sweater. Once the sweater is finished, she looks for friends and neighbors to outfit in warm wool creations. It is not long before she transforms her dreary, wintry grey town into a cheery, cozy world using the apparently endless supply of yarn. When an archduke arrives and offers to buy the magical box and its contents, Annabelle refuses him. He decides that he must have it and sends robbers to get the box from her. 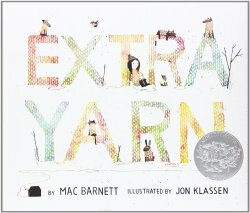 A fascinating fairy tale that explores generosity and community, Extra Yarn is best suited to children aged four years and up. 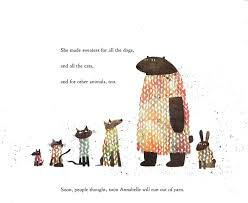 Fans of Jon Klassen will enjoy spotting some of his trademark characters wearing Annabelle’s cozy gifts. When my boys were young, books about trucks and other large vehicles were enormously popular with them. I don’t know how many times we read Truck Song by Diane Siebert and Cars and Trucks and Things That Go by Richard Scarry. Anything with more than four wheels had incredible appeal. Road construction was similarly exciting and stopping to watch an excavator or a paving crew could become the highlight of our day! Truck tells us the story of a large, red semi trailor truck that is transporting a load of bicycles. The distinctive vehicle leaves one city, rumbling through a tunnel and eventually travelling overnight. Miserable weather and other trucks accompany the red semi trailor filled with bicycles to a rural highway. Children will love the busy interchange and the foggy roadway leading up to a bridge and the approach to another city. Young transportation enthusiasts will enjoy “reading” the roadsigns, learning about direction and examing the other vehicles as they follow the big read truck on its journey. Highly recommended for truck lovers ages three and up. Truck was as ALA Notable Children’s Book and a Caldecott Honor Book. It is available in a variety of formats including board book. 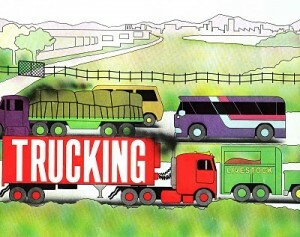 Truck theme interlined paper for beginning writers. “Moon over Manifest,” written by Clare Vanderpool, is the 2011 Newbery Medal winner. The book is published by Delacorte Press, an imprint of Random House Children’s Books, a division of Random House, Inc.
Four Newbery Honor Books also were named: Turtle in Paradise, by Jennifer L. Holm and published by Random House Children’s Books, a division of Random House, Inc.; Heart of a Samurai, written by Margi Preus and published by Amulet Books, an imprint of ABRAMS; Dark Emperor and Other Poems of the Night, written by Joyce Sidman, illustrated by Rick Allen and published by Houghton Mifflin Books for Children, Houghton Mifflin Harcourt; and One Crazy Summer, by Rita Williams-Garcia and published by Amistad, an imprint of HarperCollins Publishers. A Sick Day for Amos McGee, illustrated by Erin E. Stead, is the 2011 Caldecott Medal winner. The book was written by Philip C. Stead, and is a Neal Porter Book, published by Roaring Brook Press, a division of Holtzbrinck Publishing. Two Caldecott Honor Books also were named: Dave the Potter: Artist, Poet, Slave, illustrated by Bryan Collier, written by Laban Carrick Hill and published by Little, Brown and Company, a division of Hachette Book Group, Inc.; and Interrupting Chicken, written and illustrated by David Ezra Stein and published by Candlewick Press.